I swiped this picture from somewhere, someone on the Web. My older-middle-aged mind is preventing me from remembering where I got it from. 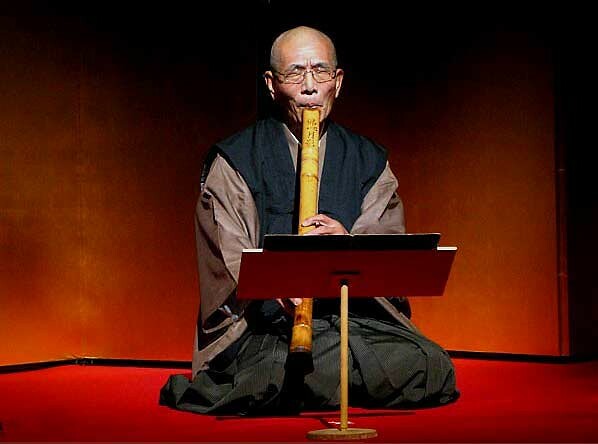 Can anyone identify this shakuhachi player and any other pertinent information about the circumstances of this photo? 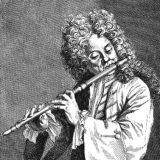 Chris, you probably pilfered the image from Dean Del Bene's "Myoan Shakuhachi" site where it was posted with the player unidentified on 6/22. If you're looking for a caption again, how about "If I scrunch my face up, maybe I can hit this high note..."
But making captions to real photographs is kind of disrespectful to the player, even if unidentified. My apologies to the player, who I'm sure could make most of us wish we could play as well if we could hear him. BTW, Chris, It looks like you removed some of threads with the great captions and jokes. Those were good, do you think you could put those someplace where they could be looked at occasionally? Maybe your blog, but then you might run into copyright problems.